I've been a little obsessed with two thins this week: roasted asparagus (with garlic and olive oil) and ice cream. Though not together. Now I'm reminded of a Far Side comic. Apologies to Gary Larson for blatant copyright infringement. 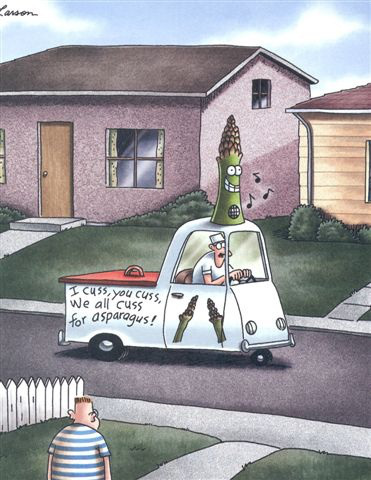 I wasn't sure how else to reference this comic, but I bet it's somewhere in The Complete Far Side: 1980-1994. I touched on it a little bit yesterday with my list recapping the things I've enjoyed this week but I've been enjoying making simple, healthy things in the kitchen. This past week it was an assortment of roasted vegetables and now a 120-hour soup that I'll probably write about later in the week if nothing else more interesting happens. Oh, and there's also been ice cream. My interest in cooking seems to coincide with summer, for reasons I'm not entirely clear on (Maybe it's simply that the things I enjoy cooking are more readily available in the summer. And that I secret want to cook everything outside, on an open flame, on a parrilla.). The season also rekindles another interest that I'm 100% clear on: ice cream. Because I managed to travel in a way that almost entirely skipped winter last year I found myself eating more ice cream than usual. It might've helped that helado is also effectively the third most-popular religion in South America, as far as I can tell. I particularly remember a lot of dulce de leche ice cream (Argentina), durian ice cream (Malaysia & Hong Kong) and green tea ice cream (Basically... everywhere in Asia, as best I can recall.). Today I ended the week properly with one of my favorite local ice cream snacks: Ruby Jewel ice cream sandwiches. A happy union of two of my favorite things: ice cream and cookies. I tried the chocolate and salted caramel, which was quite good, but my favorite might be lemon and lavender. To summer and ice cream!